Whether you're buying or renting, moving house involves a period of intense organisation, excitement and, unfortunately, cost. But as always, there are plenty of ways to save. Renters should also plan ahead, factoring in agency fees and contract fees, plus the cost of a deposit - this is usually six weeks' rent. Then it's time to estimate your standard removal costs. You can use our free Money Dashboard money management software to calculate how your finances are faring, and set savings goals to cover your costs. Our automatic tagging feature gives you a clear view of exactly where your money is going, helping you pick the right areas to cut back. Catalogue everything you pack to minimise breakages, losses and to save time later. After all, time is money. Taking stock is especially valuable for renters with landlords' property to worry about. Make a note and take pictures of all items, fixtures and fittings in the property you're leaving, and the one you're arriving at. Don't sign off on anything you haven't personally checked or agreed with. Inventories are legal documents that will be used in any wrangling over your deposit. Assess what you really need and what's just taking up valuable space in the removal van. If you're hiring people to pack or move your belongings, they're likely to charge by the hour: so all time-savings count. Remember that you can sell pretty much anything online. Auction sites like eBay or online bulletins like Gumtree are a great way to find potential buyers. For things that are easier to value, like books, CDs, DVDs and electronics, websites like Zapper, Music Magpie and We Buy Books all offer courier service for sales over a certain amount. 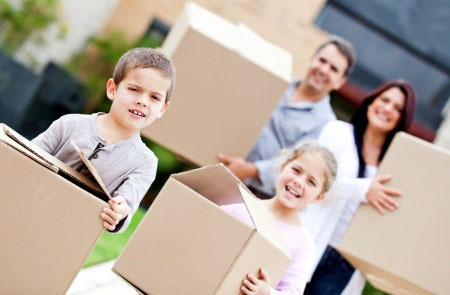 You never know, you might even earn enough to cover your moving costs. Your gut reaction might be to choose a weekend just because it seems easier, but if you can move in the middle of the week, you'll find you can save money in spades. Removal firms tend to put up rates over the weekend, and then there's the traffic to consider: so even if you're moving yourself, you could save time and money by moving midweek. If you want to avoid movers' fees altogether, now's the time to call in those favours from friends, family and colleagues. Just be sure that you're well organised ahead of time. There's nothing worse than putting everyone out and then finding people just get in each other's way. Moving all of your accounts is a chore, but if you take this chance to ensure you're getting the best deal from your gas, electricity and telecoms suppliers, it becomes a rewarding exercise in saving money. Use our price comparison tool to view what's on offer from your service providers before you commit to a new contract. Do you have any more money saving tips for movers? Let us know in the comment field below.